Charlottesville, Virginia is another world away from our Orchard House Bed and Breakfast, and yet just an easy 30 minute drive north. 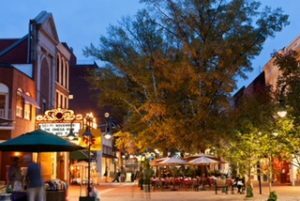 Charlottesville is home to the prestigious University of Virginia, Thomas Jefferson’s Monticello, and the historic downtown mall. The mall is the nation’s largest outdoor pedestrian shopping center, blocked on both ends so that visitors can walk safely amongst restaurants, boutiques, coffee shops, and antique stores. The menus are posted outside each restaurant, and there is literally every taste, price range, and style of dining available. Book your tour at @monticello. You can spend as much or as little time at this impressive estate as you’d like…tour the grounds, shop the gift shop, take selfies with the statues, eat lunch in the cafe, take the escorted tour through the structures. Regardless of time spent, our guests all return raving about their experience and memories! Head to the downtown mall area. Before you start exploring that little slice of heaven, jump on any of the complimentary trolleys that are stationed throughout the mall. The trolleys will take you on a short but memorable trip through Charlottesville, including UVA’s gorgeous campus. From the comfort of the trolley, you’ll see the stadium, the rotunda, the chapel, some of the dorms, and the stately halls. The trolley loops continuously, so you can jump off back in the downtown mall just in time for happy hour! Happy Hour awaits! Check out all the great options in the downtown mall. Some of our favorites include The Fitzroy, Red Pump Kitchen, The Whiskey Jar, and Citizen Burger. After some cold drinks and fabulous people watching, choose your dinner spot at any one of the amazing downtwown restaurants. You can pick your favorite by googling “downtown Charlottesville Mall restaurants”, or by calling us for additional suggestions. There are so many ways to spend a perfect day in Charlottesville; more on that in our future blogs. The best part of ending an incredible day in Charlottesville is returning home to the Orchard House Bed and Breakfast. The amazing stars, pond frogs, chirping birds, mountain views, and country living are all welcomed ways to wrap up a perfect day.